Here's a look at another one of my favorite ShopRites! I've always been a fan of the RoNetco stores, even though they're a little on the older side as a group. Gee, that's not a bold claim at all. But I guess if there is such a thing, this store comes pretty close. The entrance is visible to the left in the above photo. You walk into a slightly awkward space that's not much of anything with the option to turn right into produce or continue straight, with deli and the ShopRite Kitchen along the left side in an island and the bakery along the right side wall. The expansion is not as deep as the original store. Here's that corner, with the bakery just behind the cheese department. I'm assuming that this space would have originally been the produce department. Looking up towards the front wall of the store, we see the olive bar and the entrance again to the right. There is a catering office just next to the entrance, and produce continues to the left. The expansion begins approximately where the checkerboard pattern is. It's quite a spacious produce department, with an excellent selection for a small town in northwestern New Jersey. Dry groceries run along the front wall. I believe it's mostly juice, which kind of makes sense next to produce. You can see how the expansion has an exposed ceiling but the original store has a drop ceiling. I don't know if this was a feature built into the liquor store, but it's pretty cool. It is strange that this already large store decided to expand even more so soon after it was built. Deli/prepared foods in the island to the left with bakery at the back of the first aisle. Much like the Brookdale ShopRite we saw yesterday, just a mirror image. Here in Byram, however, seafood is next to meat along the back wall. Sprawling bakery. I'd have to imagine that the increased space for produce allowed them to expand this bakery section, too. Unlike Brookdale, the donuts here are not too special (still very good), but the bagels are excellent. Looking along the back wall of the store. Deli lines the island to the left. As I mentioned, seafood followed by meat run along the back. ShopRite and other stores (such as Food Bazaar) regularly put lobsters on sale for $5.99/lb. They both receive or buy fresh seafood daily from their suppliers. So if I were to buy lobster, why should I be paying $12.99+ at a gourmet market? When The Fresh Market opened in Livingston at the site that is now ALDI, I remember they advertised that their seafood was delivered fresh two or three times a week (I don't remember which). So you really want me to pay double the price for seafood that's been sitting there for two days? Anyway, I digress. Pharmacy and HABA, delineated by the wood look flooring, come next in the first few aisles. I'd assume that the flooring was replaced after the store opened, since it looks to be newer in style and in condition than the rest of the store. The ceiling in this area is pretty low, although it gets higher for the rest of the store. Like many supermarkets, ShopRites are now offering dietitians in store with whom customers can consult for free. In fact, they are the first major supermarket in New Jersey to do so. Dietitians are also responsible for developing menus for prepared foods departments to guide the selections in a healthier direction. These graphics are very clearly newer than the rest of the store and match what ShopRite was using around 2010. Not entirely sure where this was, but I'm assuming it was near pharmacy. I actually really liked the old pre-2002 packaging, and putting a store's own storebrand on the walls was quite popular at that time, such as with the Path to Savings decor package. Ah yes. The wonderful late-90s/early-00s "put as much junk as possible around the store" approach! Actually works very well here because they've managed to keep the products aligned with the category signage. For more shelf space, they have an additional aisle running along the back of the store. Meats are on the other side of this aisle. Doesn't look like this store had the corresponding PetRite-branded signs. Livingston did until around 2012. A rare category-free aisle. The crazy thing is that, despite the store's enormous size, they still feel the need to stack things way higher than they should be. Honestly, it makes for a huge selection, which I don't mind at all. Yes! A hand-painted mural of ShopRite storebrand products with a checkerboard border! I love it! Never mind that two of these products would actually be found in the juice area, which as you'll remember was (at least in part) in the produce department. And never mind the fact that a disembodied hand is pouring chocolate milk that looks more like chocolate syrup, or perhaps taken out of context, long wavy hair. This is awesome! I appreciate the charm of this department sign. No, it doesn't match anything else in the store. Any other questions? Hard to tell exactly, but it looks like it was dated '98. That is probably then when the store opened. The rest of the dairy department is just around the corner from that area in what appears to be the other expansion. Again, I'm assuming the expansion begins at the lower-ceiling area. This aisle is again somewhat awkward, as it is double-wide and probably would originally have been the frozen aisle. Now, frozen foods are located partially in the expansion but mostly in a small alcove along the front wall of the store. Typical RoNetco layout, which we also saw in Flanders (except there it was, strangely, potato chips). 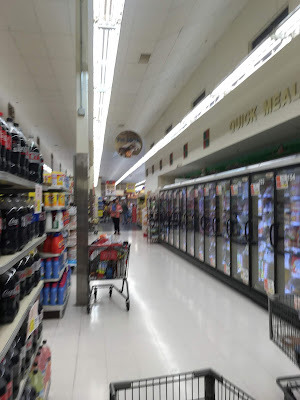 In RoNetco's ShopRite of Succasunna, the dark lower-ceiling area is home to the checkouts, not frozen foods (although that store is narrow and deep, unlike Byram which is kind of deep and wide). Incidentally, Succasunna's decor is the same as Byram's. The frozen department is nearly identical to Flanders' potato chip area. Additional freezer cases run along the front end aisle, with checkouts just beyond the freezer department. Pharmacy and customer service are at the far end of the front-end. Like the dietitian's office and HABA aisles, the front-end looks to have been redone more recently, probably around 2010. This is possibly when the produce expansion took place. Customer service, interestingly enough, is actually located in the island facing the registers rather than on the same side as the registers. I'll also point out that this 80,000+ square foot store has only 15 registers. (The 93,000 square foot ShopRite of Gateway Center in Brooklyn has 30.) This makes sense since it's in a small town in northwestern New Jersey, so its sales volume isn't huge. Even though it's the only supermarket around, it still doesn't really get packed like some others. Next to customer service is an interesting concept, and I'm not sure exactly of the story here. Looks like a used-book sale, possibly with a local library or something. Hard to tell if this is permanent or temporary, and I haven't been back since I photographed the store. I like the idea, though! Look at that -- ShopRite's not kidding when they call themselves the "low price leader!" Hardcovers $1, paperback $0.50! Okay, I think that's a pretty extensive tour of this store. I couldn't say this about too many stores that were built from the ground up in the late 90s, but this store is pretty fascinating! Love those old-school store brand item signs! The book sale is pretty neat, too. Yeah, this store has a lot of personality! According to LoopNet, yes, this store (and its shopping center) was built in 1998. This was presumably intended to replace an existing A&P in Andover (now the Open Box Shop). Thanks for the research! You mean that the store was planned as an A&P? What makes you say that? This was never intended to be an A&P; it's the former A&P located a few miles north on Rt. 206 in Andover. As a long-time shopper at this store, I can clear up some things. The cheese area was produce before the expansion, and they redid the front-end simultaneously with the expansion. The area where the dietician is was I believe the floral area (I haven't been to Byram in a while so some things still aren't clear). There used to be an in-store bank, originally Skylands Community and then Fulton Bank, but they took that out a few years ago, I'm not sure what they replaced it with (it was located between the entranceway and the checkout area). The freezers cases along the front end used to go into the wall deeper; at some point they pushed them out more, which sadly meant the model train that used to run above the cases had to be taken out since it couldn't be reached (you can still see the area where it was above the cases). And the space in the entranceway that says it's the "store you've been looking for" used to say "Shop Rite The Market Place" (I'm not entirely sure what that meant, but all Ronetco stores have it somewhere-- the store we usually go to, the Mansfield location, has "The Market Place" on the exterior). Thanks for all the information! It's a good question what's between the entrance and the checkout area, I'm not sure myself. The whole entrance area into produce feels very open, like there ought to be more than there is.